This week on the Authentic Influencer Podcast, we’re talking about how to make it in network marketing as an introvert. If you are involved in network marketing or have an interest in this area of business, you are probably not a true introvert! Life as an entrepreneur (and a successful human) is about continuing to find ways to grow and move forward. You aren’t trapped as an introvert! Brooke shares her personal experience with learning to break out of her shell. She grew up believing she was an introvert and began her network marketing business fearful of chatting on the phone and approaching people. 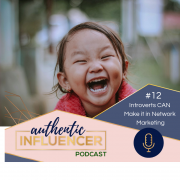 If you identify with this struggle, make sure to listen in and learn more about how Brooke overcame the challenges faced by an extroverted introvert. Each week we leave you with a challenge to help you apply the concepts we discussed to your life. If you haven’t already, take the time this week to identify where you are. Are you an introvert, extrovert, or an ambivert? After you’ve identified your type, do one thing that is out of your comfort zone. Challenging yourself and doing the things that take a little courage are the best way to grow in your business and in your life! Get a little uncomfortable this week.